The scatterometer on Aquarius operated in a band shared with other active "services" including air traffic control radar. 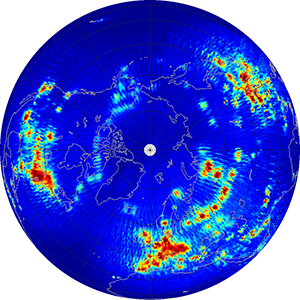 Fortunately, over the ocean where the scatterometer data were needed most, the radio frequency interference (RFI) was small. However, over land there was significant and persistent interference with the scatterometer signal. Radio Frequency Interference (RFI) can cause errors in the salinity estimated by Aquarius by affecting the signal received by the microwave radiometers and the scatterometer. The scatterometer is important for correcting for the effect of ocean waves (surface roughness). The images below (click to enlarge) show global monthly RFI for ascending/descending passes as detected by the scatterometer (Le Vine and de Matthaeis, 2014). 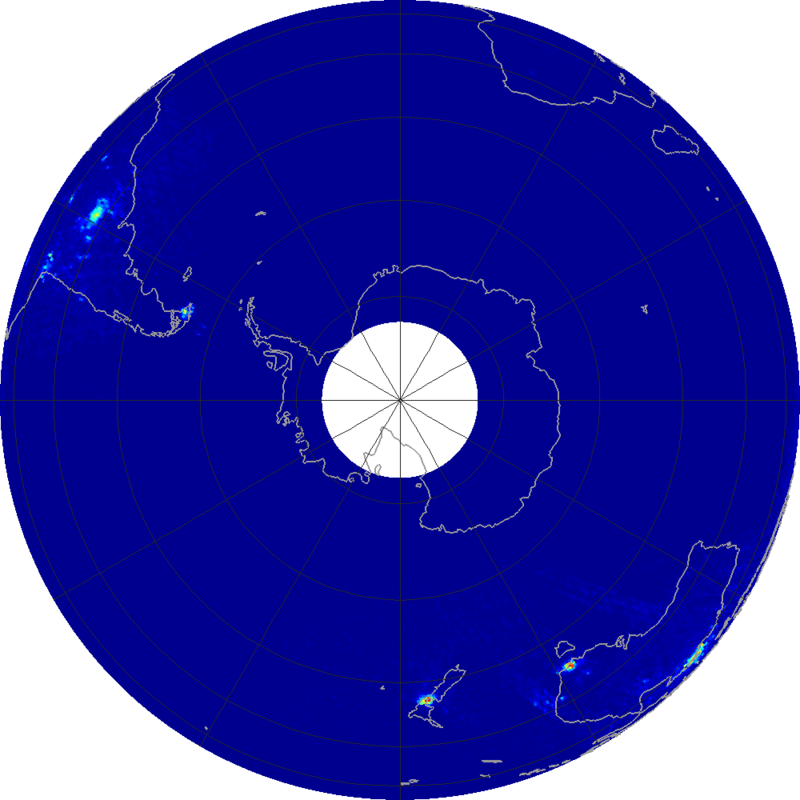 The data are presented in three different projections (Mollweide, Orthographic Northern Hemisphere, and Orthographic Southern Hemisphere) at 1.26 GHz, the frequency of the Aquarius scatterometer. 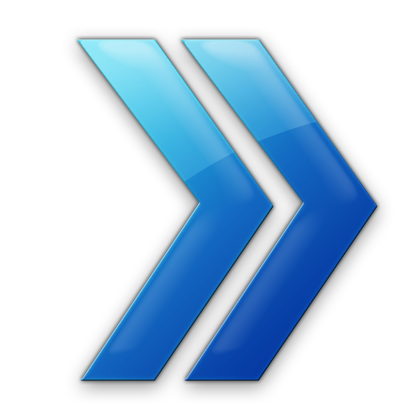 Maps showing data collected only during ascending (northward) passes and descending (southward) passes of the satellite are also available. 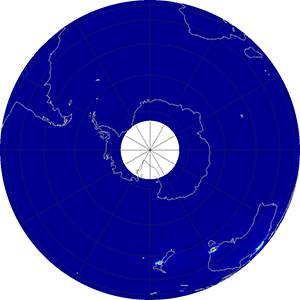 Maps in Plate Carrée projection are available upon request. 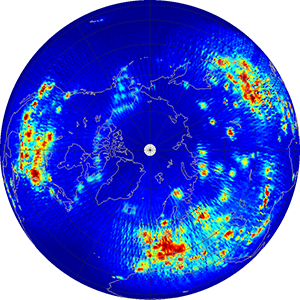 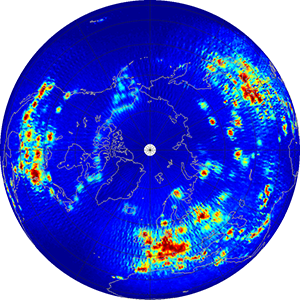 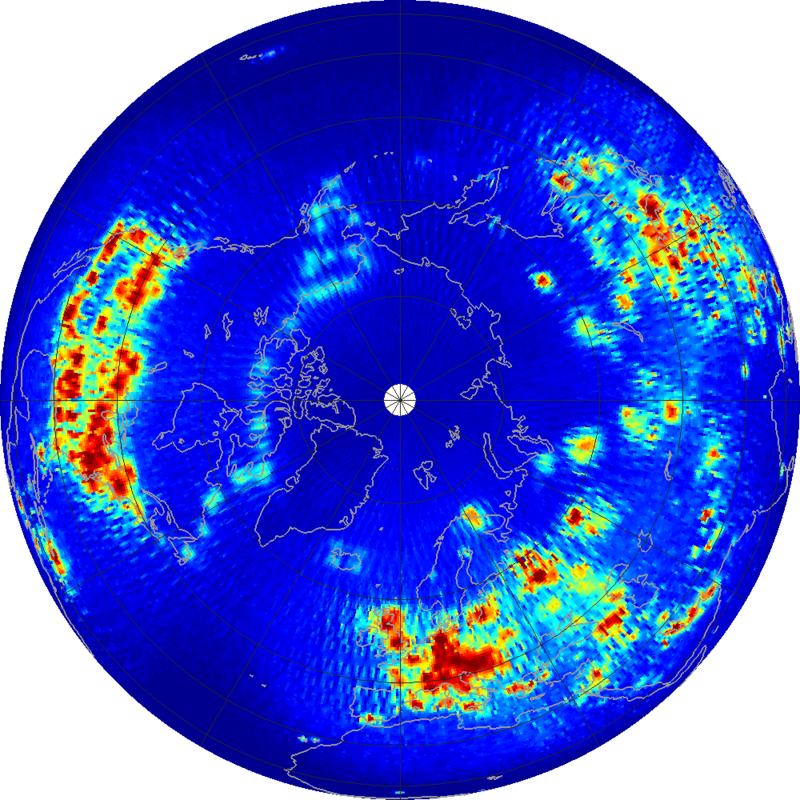 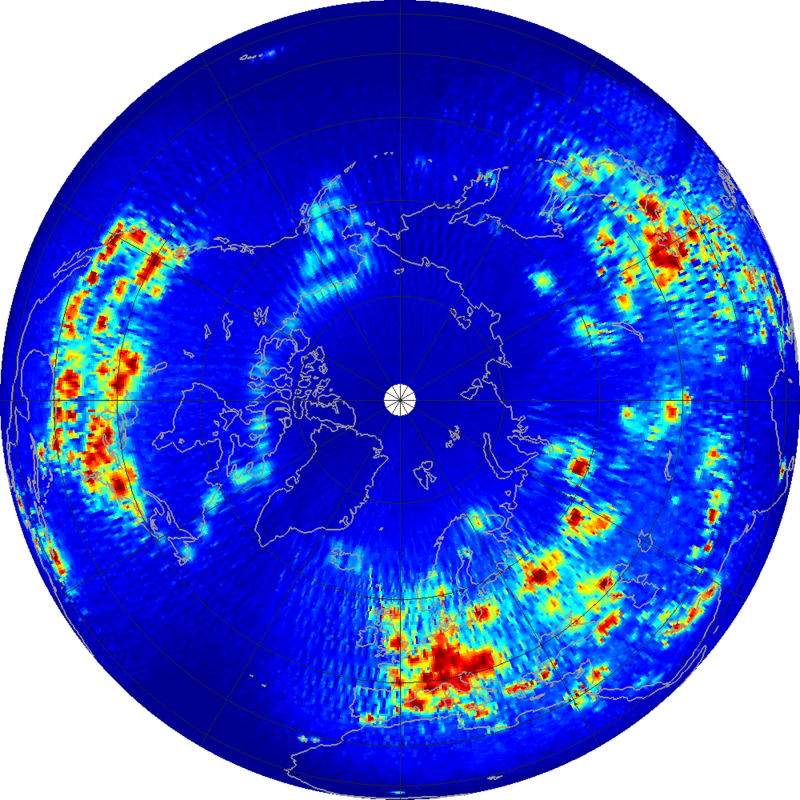 Each data point represents the average of scatterometer measurements over 1.44 seconds (the fundamental data block in Aquarius Level 2 data). The color scale indicates the percentage of radiometer measurements within this window that are identified as RFI by the RFI detection algorithm (Le Vine and de Matthaeis, 2014). Measurements identified as RFI are removed from processing and not used to calculate salinity. Red colors indicate areas where over 80% of the sampled data are flagged for RFI presence. Dark blues show relatively little detected RFI, with less than about 10% of samples flagged in these regions. 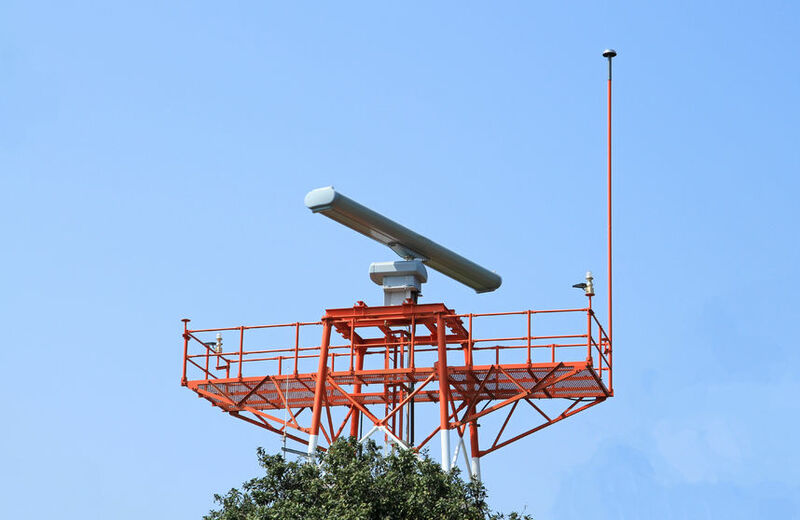 The scatterometer operated in a band shared with other active "services" including air traffic control radars, which are known sources of interference. 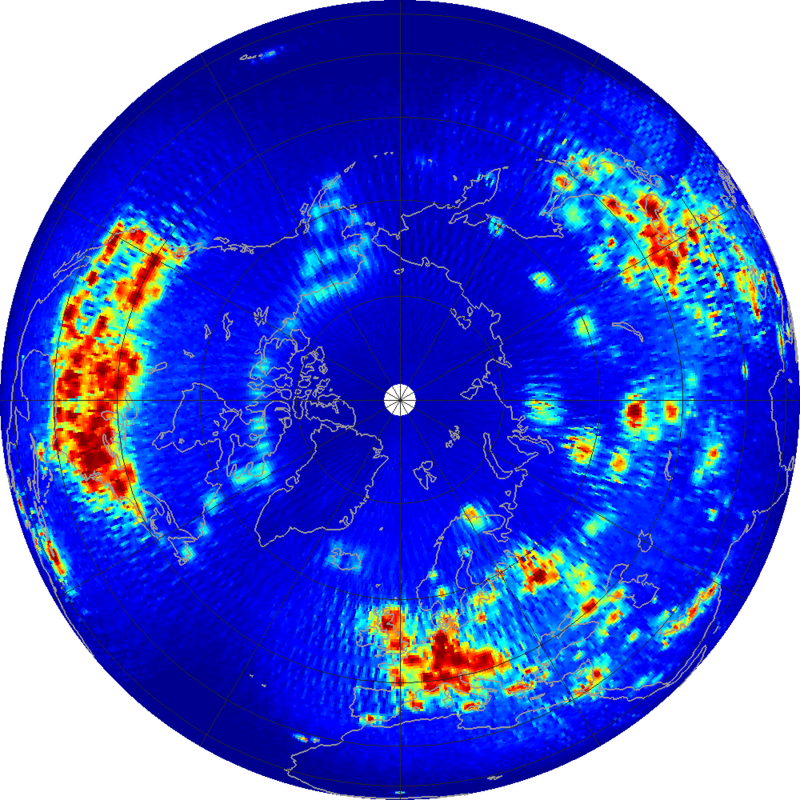 Fortunately, over the ocean where the scatterometer data are needed most, the interference is small; however, over land there is significant and persistent interference with the scatterometer signal. 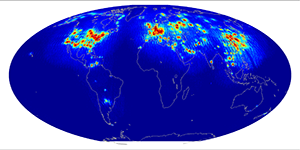 Images are provided by Paolo de Matthaeis, NASA Goddard Space Flight Center.